When Viktor Yanukovych came to power in 2010, he announced that preparations for football’s Euro 2012 would be one of his priorities. And the main source of funding for the championship was to be his country’s exchequer. Money that could have been used to build hospitals would go instead to stadiums and motorways. The first thing built by the state owned road construction company was a mini motorway on the outskirts of Kyiv. In a country whose roads generally resemble tank ranges, the appearance of a highway with a beautifully smooth surface was bound to attract attention. Official sources hastened to explain that it was built as part of the preparations for Euro 2012. The only thing is that the road is not part of any transport network linking Ukraine with Europe. 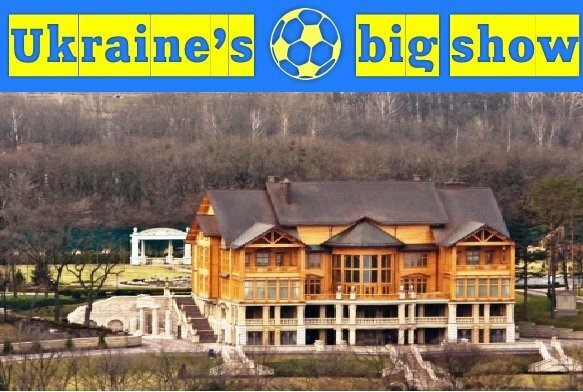 Officials used money destined for Euro 2012 to build instead a road linking the capital with Mezhyhirya, President Yanukovych’s private residence, which has become the symbol of Ukrainian corruption in high places. 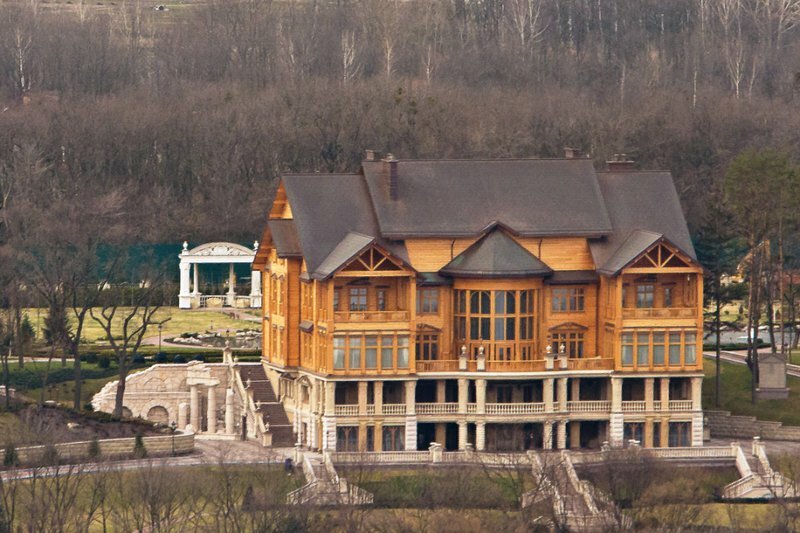 Experts estimate the cost of Ukrainian President Viktor Yanukovych’s new private residence at 75 – 100m dollars. For most of his career he was a public servant or parliament deputy, where his salary never exceeded 2000 US dollars per month. The Mezhyhirya residence was built in the Soviet period on the site of a monastery that had stood there since the 14th century before being destroyed by the Bolsheviks. The Soviet regime, under which Ukraine lived for 70 years, tried to provide for all its leaders’ needs. Top communists were rewarded with a package that included a house in the country – a so-called ‘dacha’. Mezhyhirya, which was at the disposal of the leader of the Ukrainian Soviet Socialist Republic, fell into this category. After Ukrainian independence the building was used to accommodate foreign delegations, but when in 2002 Viktor Yanukovych was appointed Prime Minister and moved to Kyiv from industrial Donetsk he decided he would like to live at Mezhyhiriya. Initially he rented it, but the Orange Revolution brought a fall in his living standards – a terrible thing for Post-Soviet Man. The new government, headed by president Yushchenko and PM Tymoshenko, evicted him from his home. But a year later, after the fall of the Orange dream team, Yanukovych returned to the post of Prime Minister and secured the right to Move back into Mezhyhiriya, which was still government property. And another year later, in 2007, when he left his post, he took the house with him. Mezhyhiriya, meanwhile, was acquired, without any competitive tendering process, by a Donetsk company called ‘MedInvestTraid’, which immediately resold it and a few years later filed for bankruptcy. Was someone covering their tracks? In 2009, after an unsuccessful bid to create a political alliance with Viktor Yanukovych, Yulia Tymoshenko tried to return Mezhyhiriya to state ownership, but nothing came of it. MPs from Yanukovych’s party removed all the documents relating to the sale from the government departments involved. The new residence of president Viktor Yanukovych is decorated with imported natural marble, Italian crystal and precious woods. And a few months later Yanukovych became president, and could stop worrying about it. Especially since he had managed to register the deeds of the property in the name of several European companies, one of them British. 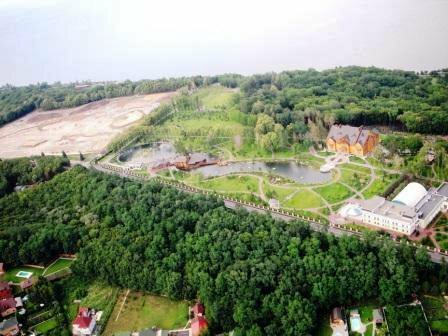 Yanukovych is now the proud occupier of 137 hectares (340 acres) of land on the banks of the river Dnieper. This is an area a little smaller than the principality of Monaco, which occupies 195 hectares. On the other hand, the population of the principality is 30,000, whereas the sultanate of Mezhyhiriya has but one single inhabitant. The period after Viktor Yanukovych’s inauguration was ‘the golden age’ of Mezhyhiriya. All the buildings constructed in the Soviet period, where the Communist leaders had lived, were demolished. In their place rose a five storey palace of log and stone. Once, Viktor Yanukovych even had an opportunity to boast about his property. On a visit to Berlin in 2010, he was speaking to an audience of local intellectuals and, wishing to pay a compliment to his host nation, he told them had imported German craftsmen to construct his estate and was very pleased with their work. The mansion itself, crowned with a roof of pure copper, was built by the Finnish company Honka, the world leader in the construction of log buildings of all kinds. Apparently Yanukovych’s home is the largest wooden structure ever built by Honka, and the company even wanted to nominate it for inclusion in the Guinness Book of Records. But its owner declined this honour. The royal scale of the residence played, however, a bad joke on the president last winter, when its heating system could not cope with the coldest weather for six years. The president was left freezing in his drawing room, where the temperature refused to rise above 16 degrees Centigrade. Legends are being created about the presidential compound. Among independent Ukrainian journalists there is an unspoken competition as to who will first publish photos of this monument to national corruption. The sheer scale of Mezhyhiriya is mindboggling. The Ukrainian Customs and Excise Department’s database lists details of fixtures and fittings imported for its embellishment. Each of the mansion’s Lebanese cedar doors cost $64,000. Three sets of wooden panelling for staircases came in at $200,000, wall panelling for the winter garden at $328,000, and cladding for a neoclassical column and parapet for a flight of steps at $430,000. In the course of one and a half years the overall cost of fittings imported for Mezhyhiriya was $9,416,000. 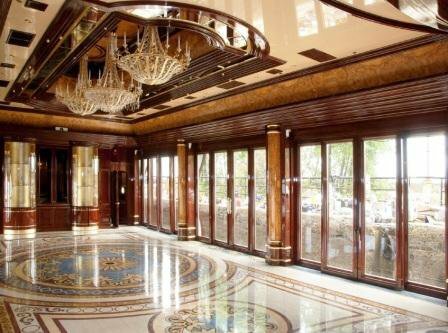 The price of the chandeliers in Viktor Yanukovych's new residence has shocked Ukrainians. 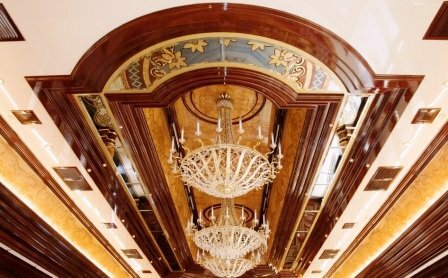 In a country where 35% of the population live under poverty line, spending 100 000 dollars on each individual chandelier seems excessive, to say the least. The grounds around the house have been laid out as a formal park, with decorative planting and water features. The ‘Ukrainska Pravda’ newspaper, which has been following the Mezhyhiriya story for three years, recently published shocking photos of one of the estate’s features - a landing stage and pavilion on the bank of the Dnieper. 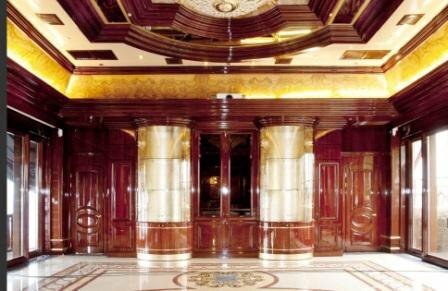 Inside there is a stage and karaoke equipment – Viktor Yanukovych likes to spend summer evenings relaxing here. The photos show a building decorated in gold paint, with a marble floor – a kind of mini Versailles. On specialist websites one can also find photos of a gilt and crystal chandelier that hangs in the pavilion. It cost $100,000. For a more exotic presidential leisure experience, Mezhyhiriya has its own private zoo, where one can admire not only local forest fauna but also ostriches and even kangaroos, imported specially for the president’s pleasure. A few years ago, however, this led to a catastrophe when one kangaroo escaped while being fed, and another died of pneumonia – they’re not used to temperatures of -15 in Australia. The compound also includes facilities for more active leisure. An eighteen-hole golf course, visible on satellite photos, is under construction. It has been designed and built by French specialists, at a cost of 2-3 million dollars. The president is also very fond of horses, and is having a riding club with an indoor exercise space built. Foreign politicians who want to cultivate Yanukovych’s friendship – the presidents of Poland and Turkmenistan, for example - give him gifts of horses. Finnish company Honka were in charge of construction on Yanukovych’s house. During one of his visits to Germany, the Ukrainian President himself praised the German specialists working on the site for the high quality of their work. Viktor Yanukovych can also enliven his work days at Mezhyhiriya with a game of tennis or ten pin bowling, or a session at his underground shooting range. The president is a keen hunter, and has acquired another estate near Mezhyhiriya to satisfy this passion. Another peculiarity of the president is his fear of being poisoned. Because of this he has had greenhouses built in his compound, designed to mimic twenty climatic zones. The idea is that anything Yanukovych wants to eat can be brought to his table directly from his own farm. Mezhyhiriya continues to expand. Last summer saw the completion of a yacht club, a garage complex for the president’s collection of 70 cars and a helicopter pad and hangar. This aircraft is, in fact, the subject of a separate tale of corruption. The president’s administration rented a helicopter for him from Blythe Associates Inc., a company registered in the British Virgin Islands which used to be a shareholder in the Austrian company that is Mezhyhiriya’s official owner. In other words, Viktor Yanukovych has evidently been unable to think of anything better than to organise himself a personal helicopter out of public funds. Viktor Yanukovych spent his entire working life as a government official, and his wife is a pensioner. Before he was elected president he received a Ukrainian MP’s salary, equivalent to up to $2,000 a month. He has no official income to explain this level of expenditure. To buy one door for his residence for $64,000, he would have had to put by three years’ worth of salary, without even allowing for living expenses. Admittedly, Yanukovych’s latest tax return put his income somewhat higher. It turns out that last year, on top of his salary, he received $2,000,000 from a Donetsk publisher for an as yet unpublished, and indeed unwritten, book of memoirs. Given that his previous foray into literature was a fiasco – he was accused of plagiarism and the book removed from the shelves – it is not surprising that this large fee was immediately interpreted as a means of laundering the president’s shadier sources of income. In Ukraine, which occupies 152-nd place (out of 182) in global corruption listings, such facts about Yanukovych do not even raise an eyebrow. Corruption is endemic in the whole power vertical, from traffic policeman to government minister. That is why there was no public outcry at ex-Premier Yulia Tymoshenko’s seven year prison sentence. Her reputation is as stained by corruption scandals as Yanukovych’s. From the president’s lifestyle it is clear that he has hidden sources of income. Viktor Yanukovych realised that it would be impossible to explain away his enormous expenditure on Mezhyhiriya, so the deeds to the property were officially registered to third parties and quietly squirrelled away in European tax havens. Officially, Mezhyhiriya belongs to the Donetsk firm ‘Tantalit’. Its director is a complete unknown by the name of Pavel Litovchenko, a former employee of Yanukovych’s elder son. And, as Yanukovych’s younger son once let slip by mistake, Mr Litvichenko is now the president’s family lawyer. ‘Tantalit’ was set up and is 99.97% owned by an Austrian company, Euro East Beteilungs GmbH. After that the trail leads to the UK. The Austrian firm is 100% owned by a British company, Blythe (Europe) Ltd, with a registered address in London, at Formations House, 29 Harvey Street. Here, for a small sum of money, you can set up a ‘front’ company. The Russian speaking staff explain that post-Soviet oligarchs and officials also like using the UK as a cover for their dodgy income. After London, the Mezhyhiriya trail leads to the pocket principality of Lichtenstein. All the shares of Blythe (Europe) Ltd belong to the Lichtenstein based P&A Corporate Services Trust. Blythe (Europe) Ltd also crops up in relation to Yanukovych’s hunting grounds near his residence. This enormous tract of forest, 300 square kilometres in area and home to wild boar and elk, is still formally the property of the state, but Viktor Yanukovych built himself a palatial hunting lodge there. The entire property constitutes 140 hectares of valuable land which lies alongside the Dnieper river. It too belongs to Blythe (Europe) Ltd. After that the whole hunting ground was surrounded by an anti-tank trench and patrolled by armed guards working for Yanukovych’s family. No one can go into the forest any more. Journalists from Ukrainian TV’s Channel 5 recently decided to have a picnic in the forest, as an experiment. They had not gone 100 metres before finding themselves continuing their afternoon under the watchful eye of armed special forces. The story of Viktor Yanukovych and his residence highlights a paradox. Having completely rejected such European values as human rights and democracy, the Ukrainian president uses Europe as a place to hide his dirty money with impunity. European leaders who are critical of Yanukovych could put pressure on him through his European assets – deeds, not words. Oddly enough, that was once the slogan of the Orange revolution in Ukraine, which for a brief moment put Ukraine back on the road to democracy.